- Google creates a new holding company called ‘Alphabet’ to hold a collection of companies. - WTI was $42.23 and brent crude oil $49.22 on 8/14. See no bottom on oil prices, yet. - Buffett's Berkshire sheds National Oilwell Varco and Phillips 66 stock. - JC Penney's net revenue totaled $2.88B, up from $2.80B during the same period last year. 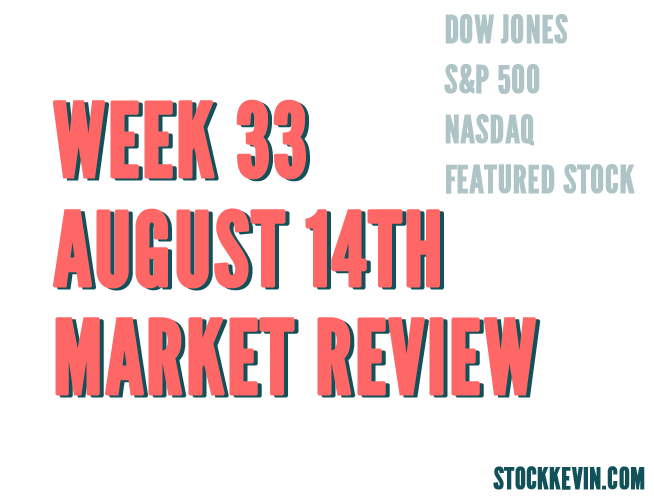 The Dow Jones Industrial Average (DJIA) closed at 17477.4, which was about a 104 point decrease versus a week ago of 17373.38 on Friday, August 7th 2015. We've are now in a pretty clear downtrend and this is evidently favorable for bears. For the bulls, we'd like to see price action above 17610 or the 20 DMA. This would signify a return to the prior trading range. 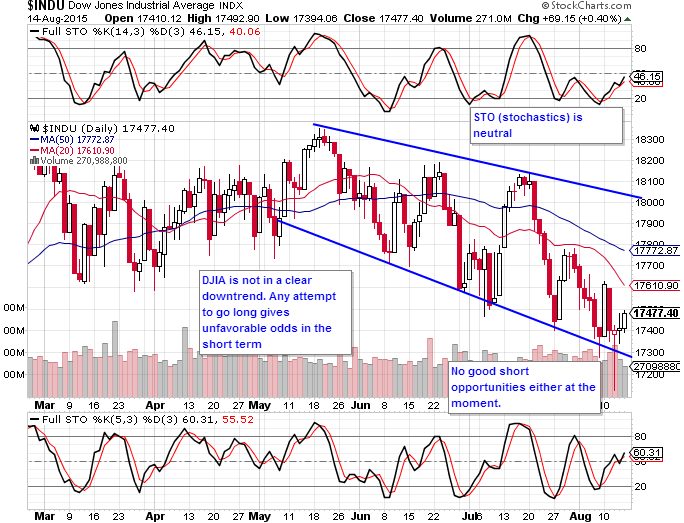 Though the bears appear to be in charge in the short-term, currently there appears to be no good short opportunities. We want to limit our risk to reward ratio when entering trades. 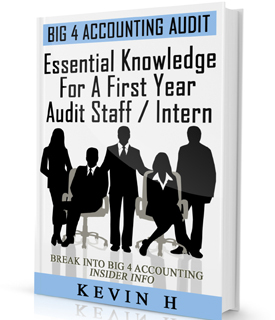 One way of doing this is through position sizing. However, I digress. 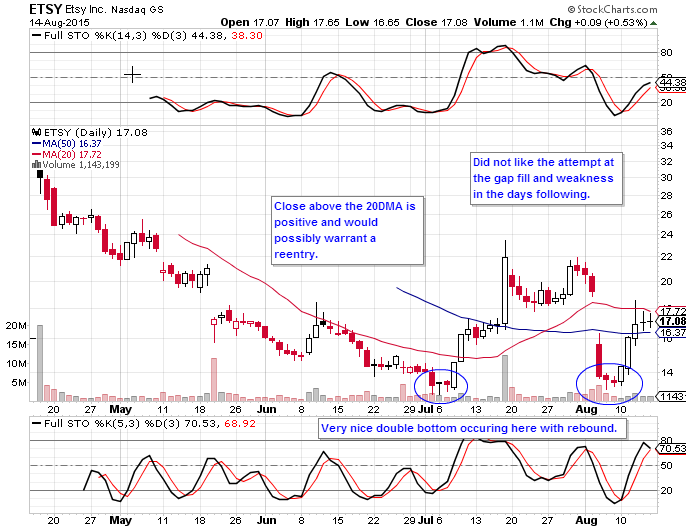 In any event, a move towards the 20 DMA or the 50 DMA present low risk short opportunities. In addition, I'd like to see the STO (stochastics indicator) overbought. That is the trend follower stock plan. 2077.57 on Friday, August 7th 2015. This was about a 14 point swing to the upside. It looks like we are just ping ponging back and forth and have formed a symmetric triangle. Typically, this means there will be a break in either direction. To us the SPX looks fairly neutral right now, meaning there is no clear indicator as to whether we will see further downside or upside action. For now, it appears to be consolidating horizontally. However, if we had to pick a side and just based on recent market action, more downside action could happen. The Nasdaq (COMPQ) closed at 5048.23 on August 14th, 2015 versus 5043.54 on August 7th, 2015. Once one of the strongest in the group, COMPQ is now showing signs of deterioration. 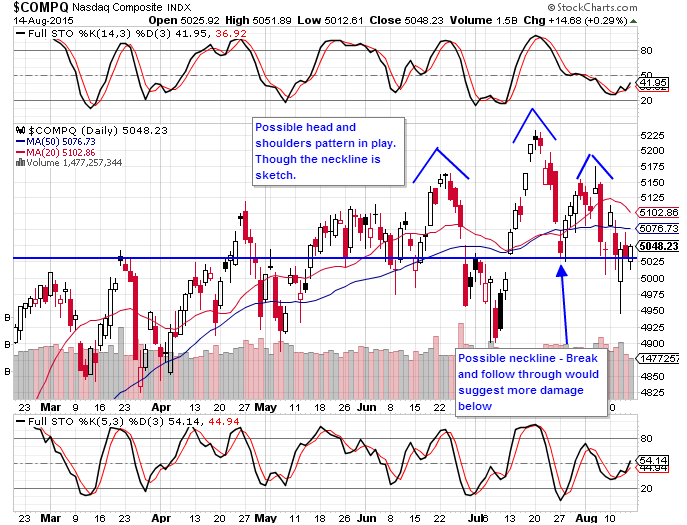 We can see a bearish head and shoulders chart pattern below. The top of the triangle being the head and the two sides being shoulders. 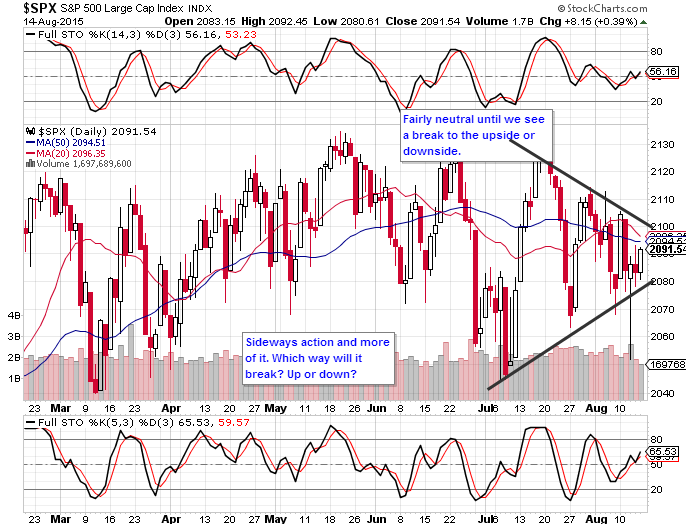 Like the SPX it now looks like the COMPQ is in neutral territory with a hint of bearish indicator. When we see this sideways action occur, it is typically a stock picker's market. That means you will find stocks that break out and break down. You just have to be picky with what you select. This is in contrast to a bullish market where every other stock just goes up or alternatively a bearish market where just about everything goes down. Etsy Inc. (ETSY) is a marketplace similar to that of Amazon and Ebay, but in a niche market of handmade or craft goods. Its recent IPO allowed individual investors to purchase stock at a price of $16, which we were able to take full advantage of. The day it started trading on the market, the stock shot up to $30. Whereby we sold the day after for a hefty profit. However, since then the stock has missed earnings expectations and still continues to show a net loss on its profit and loss statements. The market has not been kind to it as we've seen it trade as low as $13-$14 a share. There were two opportunities to take advantage here. The first in July and the second in the following month August. First, in July we saw a reversal of the downward trend and in August a double bottom. Though it is possible that we will see a complete gap fill of the gap down in August, current price action shows some weakness. We'd like to see a close above the 18 price level to see if it can make a run at $22. Disclosure: We do not have a position in ETSY at the time this article was first written. The information provided on this site is not advice to buy, sell, hold, trade, or invest in any securities. I am not a financial professional. Do your own research before acting on any information provided on this site.